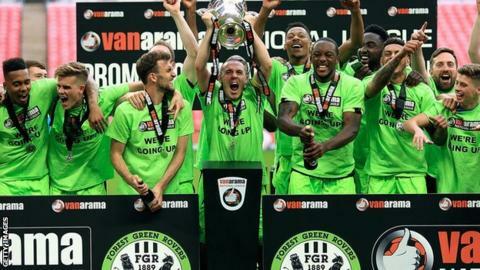 Forest Green Rovers have been promoted to the English Football League for the first time in their history after a 3-1 win over Tranmere Rovers in the National League promotion final at Wembley on Sunday. But just how much do you know about the world's "greenest" football club? BBC Sport looks at five things you may not be aware of about the non-league outfit, founded in 1889. The smallest town with a league side? They have not kicked a ball yet and Forest Green have already broken an EFL record. The Gloucestershire town of Nailsworth, where Rovers are based, has become the smallest settlement to ever host a Football League club. With a population of just 5,800, Nailsworth is home to about 2,000 more people than attended the second leg of Rovers' 3-1 aggregate play-off semi-final win over Dagenham & Redbridge at The New Lawn. In July 2015, Forest Green unveiled plans for a new stadium within an 'Eco Park', to be ready later this decade. Owner Dale Vince, who believes the club can "easily win promotion to League One", ambitiously and confidently declared that Forest Green "will be" a Football League club by the time they eventually move in. The plans for an all-seater stadium and a 100-acre sports and green technology centre - all next to junction 13 of the M5 - have impressed supporters. Similarities can certainly be drawn with Gloucestershire's newest 'environmentally-friendly' service station, nearby on the same stretch of motorway, serving locally-sourced food, and this new stadium is part of Vince's vision for a green club. For example, in December 2012, the club won an award for growing a pitch without using chemicals. The 'organic' playing surface, spread using Scottish seaweed, is thought to be the first in the world. The surface was criticised by former manager Ady Pennock last season, perhaps accelerating him being replaced by current boss Mark Cooper. But with solar panels powering the electricity at The New Lawn and the club even using a solar-powered lawn mower to trim the grass, Vince has gone all-out in his aim to be the greenest club on the planet. Fans of League Two clubs visiting the Gloucestershire side next season will not be seeing beef burgers and steak pies on the menu at The New Lawn. That is because owner Vince has introduced vegan-only food for supporters. But the players themselves are banned from eating red meat and dietary habits have been known to be a factor during recruitment. The National League side take bringing players in very seriously. The club use the 'Moneyball' philosophy, using statistics to determine which players to sign. However, they now have a vacancy in that department after performance analyst Charlie Reeves left to take up a role with Premier League side Everton. The economics graduate joined the club in October 2015 and said: "I'm extremely grateful to Forest Green for supporting my work - they have always given me all the tools I needed to push the analytics as far as I could. "At Everton, I hope to have a meaningful effect on the way the club works, utilise the power of data analysis and ultimately the performance of the team on the pitch." The original version of this story appeared on the BBC Sport website on 13 May 2016.